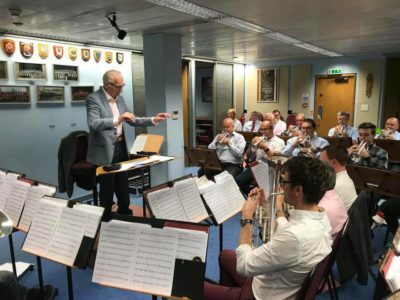 The International Staff Band (Bandmaster Dr. Stephen Cobb) was back in their bandroom on 5 September 2018 to recommence rehearsals after the summer break. The band was encouraged to see two new faces taking up their appointments in the band. Tom Neilsen (Croydon) joined the solo cornet bench, and Will Hudson (Bromley/William Booth Memorial Halls) joined the bass section, sitting alongside Martin Blessett on B♭ bass. Bandmaster Cobb welcomed them into the fellowship of the Staff Band and they, along with Martin Blessett, were presented with their official appointment letters from the Chief Secretary. After Neilsen, Hudson, and Blessett were officially welcomed into the band, Bandmaster Cobb recognized the years of faithful service given to the band by departing members Trevor Caffull, Martin Tiplady, and Paul Sharman. Former Staff Band member Major George Whittingham, who is a frequent visitor to the bandroom, recently celebrated his 92nd birthday. He was presented with a copy of the Staff Band’s latest Christmas recording and invited to conduct the band in the classic march Montreal Citadel (Norman Audoire). This article was posted in News and tagged appointment, farewell, George Whittingham, International Staff Band, Martin Blessett, Martin Tiplady, Paul Sharman, rehearsal, Stephen Cobb, Tom Neilsen, Trevor Caffull, Will Hudson on 22 September 2018 .